Learning to Love the Unknown. | The girl who loved to write about life. 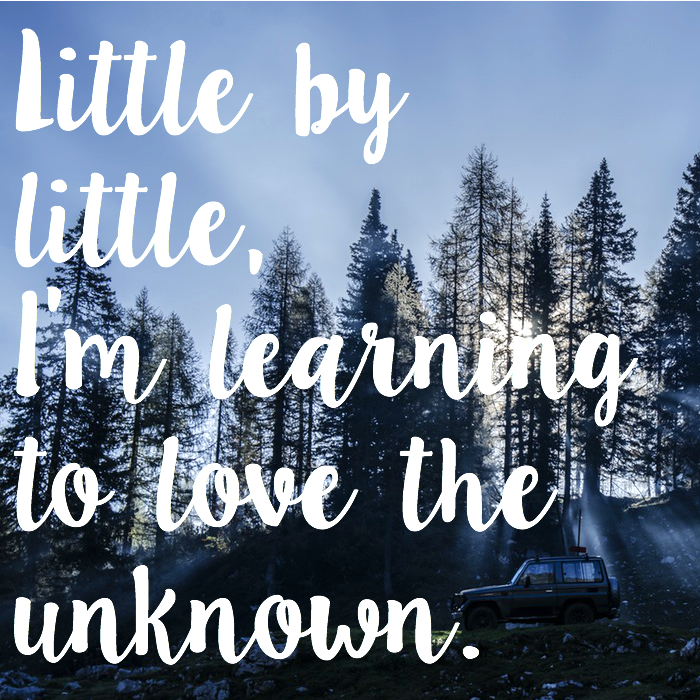 Learning to Love the Unknown. The past few nights have been spent staying up and looking at options of places to move for residency. Now, the whole ordeal is just a terrifying process, but in the spirit of wanting to be as prepared as possible, we're going through every single option (so many) and seeing what we like or don't like about it. As someone who loves well laid plans, I find it hard to look at the unknown with any sort of positive feelings. Be terrified, yes. Dread it, easily. But think of it fondly and maybe even love it? Not so much. Looking at all these cities though, I realize there are so many places that are still unknown to me. Looking at cities I've never heard of, I'm wondering what it would be like to fall in love with these places. It's making me think, so many of the best things in my life were unknown at some point. Moving from Tennessee to Florida my freshman year of high school felt like it was going to be the end of my life, but it was the very best thing. If I'd never moved here, I would have missed out on so many incredible things, but most of all, I never would have met Christopher. I wouldn't have a little family on the way. I was terrified of going to college because it was unknown, but those years were amazing. I met my best friend, fell in love with books and writing, and got to experience wonderful things. Getting married was a huge unknown, but it's been the biggest adventure of my life. I don't know this little babe yet--in fact, everything surrounding having a baby is incredibly unknown to me--but I know I will love him so much. So today, I'm learning to love the unknown. Because the very best things in my life were unknown at one point. The future is scary. Looking at all of these places and trying to imagine having a life there is just downright terrifying. But, it's exciting too. Because I know wherever we end up, it will be a journey full of adventure. Of course it's unknown--but that just means I don't yet know all the wonderful things that will happen. And I know that in a few years, I'll look back and be so happy that we stepped out into the unknown. Little by little, I'm beginning to fall in love with the idea of the unknown. The unknown never gets less scary, but it also never gets less exciting. I'm still learning, but, the more you let go of plans the more magic enters your life. Sadly, I'm finding it takes awhile to figure that out. It's all about your perspective and you're going to be an amazing mother, wife, friend, and person as you continue this journey. Embrace the adventure. You'll have your best friend at your side and a little companion to have fun with!! You so are going to rock this!! The state of the unknown is scary. I can't imagine waiting to find out where they will send you, sounds super nerve wracking. We are trying to figure out where we WANT to live and that is stressing me out a lot right now. Sending you good vibes and prayers. Being a person who loves a plan, it's really hard to remember that at every point along the way something was unplanned. Unknown. And it brought me to great things. Thanks for the reminder. Oh girl, I'm learning this lesson too. Beautifully said. As you know, I completely understand your feelings! It was both exciting and terrifying to see a map of the US and know we could be headed anywhere. Chris really had to prepare me that it could be anywhere because his specialty is so competitive. Before you know it, Match Day will be here, and you will know where you're headed! Ah I can so relate! Transition times are tough, but you have always gotten through and this time will be no different! Sometimes the best things happen in the unplanned. It's good to just go with it at times, even though I am a huge planner. I hear you on this :) We await for our babe too (and without a known due-date or even who this little person is!) and we are also looking for a house to buy. And, like you, it's all kind of thrown me for a loop. But little by little I'm getting there.. you know, to that place of feeling somewhat comfortable :) Reading this from you and knowing you are there too is comforting! The experiences you gain from doing things that you have never done are so spectacular. Your New Favorite Blog: Your Friend, Brittany. 20 Weeks: Things I Want to Remember. just write: there's magic, and it's coming. I am Becoming my Mother: The 27-Fling Boogie. 19 Weeks: Things I Want to Remember. Bucket Lists + Pumpkin Spice Giveaway. 18 Weeks: Things I Want to Remember. 17 Weeks: Things I Want to Remember. Any Day is a Good Day to Celebrate a Fresh Start.